According to Chinese astrology, those born under the rat sign are sociable, charming and lively, which brings to mind a most unforgettable and very small companion of mine. Mentioning that I had a pet rat invariably elicits a response of “eww’ or “ugh” from most people. The word “rat” conjures unpleasant images of the bubonic plague in the Middle Ages, hoards of pests the Pied Piper lured from Hamlin, or wanton killers in the horror film, “Willard.” People love to hate rats, and throughout history the rat has gotten a bad rap that is largely undeserved. Rats have also benefited man through their use in research studies of disease and intelligence, even space exploration. They have even become quite popular as pets. The number of rat fanciers has grown since the 1800s, when rats were bred, first for sport and eventually as novelty pets, in Britain. Breeders have developed a wide range of colors and markings, from Chinchilla to those already familiar to cat fanciers, Himalayan and Blue-Point or Seal-Point Siamese. There are even hairless and tailless varieties. In the early 1900s, Mary Douglas, known as “mother of the rat fancy,” elevated the lowly rat to high society with the creation of the National Mouse and Rat Club, which set breeding standards and hosted shows. When Douglas died in the late ‘20s, so did the fancy until the 1970s, when interest renewed and the National Fancy Rat Society was formed. Sacramento’s American River College was famous in the ‘70s for its Rat Decathlon, a kind of rat Olympics. Over time, people have discovered that these highly intelligent and social creatures make devoted, delightful companions. So did my family, as the following story illustrates. 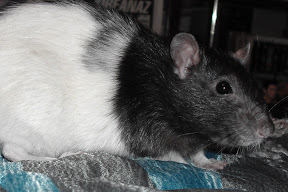 Ratty was a hooded rat, predominantly white with a “hood” of jet-black. She was one of 13 baby rats born in the Kindergarten class of Woodlake School, where I attended grammar school and my mother worked as secretary. Ratty and her littermates looked like wiggly pink worms nestled in the newspaper the mother rat shredded for a nest. The children delighted in watching over the new rodent family in their classroom. Every day taught them a new lesson in this mystery called life. Before long, the rat kittens (or rittens) sprouted fine, colored fuzz on their tiny bodies. Every weekend, it was one child’s responsibility to take the rat family home and care for it. One Friday, as my mother was leaving the office for home, she received a frantic call from the Kindergarten teacher. “I suppose so,” Mom replied. One more loose thread to weave into the endless tapestry of motherhood, she was no doubt thinking. My brother had the mumps and was spending many long, boring hours in bed. I recall how his face lit up when Mom brought the cage into his room that afternoon. “Oh! Rats!” he cried, just like Charlie Brown, his favorite cartoon character. That weekend, Mrs. Rat and her wee family entertained a sick child while leaping and cavorting among the folds of the bedcovers. My brother took a special fancy to one particular little rat, and I guess you know which one that was. As soon as Ratty was weaned, she became ours for keeps. We became immensely fond of Ratty. I had never before thought one could love something so small in such a big way. We bought a nice cage for her, but we didn’t like keeping her confined in it, and she didn’t like it much, either. Like dogs, rats crave companionship. We usually left Ratty’s cage door open when we were home so she could explore the house. She followed us from room to room like a puppy, always eager to be wherever we were. A glass door separated the kitchen from the room my father built onto the back of our modest suburban home. In those days, people were adding on rumpus rooms. If you had a rumpus room, you were keeping up with the Joneses, but I doubt that the Joneses had a pet rat living in their rumpus room. We were probably the only family in our neighborhood with a rat rumpus room. Once, as we sat eating our supper, we became aware of an insistent tapping at the door. We turned to see Ratty out in the rumpus room leaping up at the glass to get to us. Of course, we opened the door and let her in. Fortunately, we didn’t have any dinner guests over that night. Ratty loved to hitch a ride on my shoulder, where she perched and gave me rat kisses on my ear or cheek. My brother adored our pet rodent. He taught her to perform tricks and even fashioned a tiny leash for her. She was extremely affectionate with us, and we never found her repugnant, as many people would have. The days of a rat’s life are few compared to those of some other animals. Their average life span is only 2 ½ years, but Ratty had as full and happy a life as many larger pets that live much longer. And she was loved just as much. When she died, we grieved for her the same as we did for our dogs and cats. When in pet stores, I often see young hooded rats darting about in a cage, and I think of our dear Ratty. Occasionally, I see a friendly black-and-white one that reminds me of her. When it nibbles gently at my fingertip and winks at me with bright shoe-button eyes, I smile and remember my sweet, small friend. KRL’s editor-in-chief and publisher, Lorie Lewis Ham, has not only had many pet rats but was also involved in rat rescue for several years so they are near and dear to her heart, and responsible for her online persona of mysteryrat. To learn more about rats as pet one of many great resources is the Rat & Mouse Club of America. Sue Owens Wright is from Sacramento and is the award-winning author of The Beanie and Cruiser Mystery Series and other books and stories about dogs. Visit her Website. Sue, thanks for that little story. My youngest daughter was a great rat aficionado, and I must confess I spent a lot of my childhood “rescuing” wild rats and mice from the farm cats. My favorite, was Cecil, a brown-hooded rat. She spent most of her time with my daughter. When she was in her cage, and if you would happen to pass by, Cecil would grab the cage bars with her little paws and shake them vigorously–for all the world like a little prisoner. Thanks for commenting on my story. I’m glad you enjoyed it. We really loved our little Ratty. She might have been the smallest pet in our ongoing family menagerie, but she was one of the best. Your story is so typical of families who fall in love with ratties! They are the most precious, naughty little charmers it has been my pleasure to have share my life. Thank you for sharing! I was at American River College in the early seventies. I still have my Rat Decathalon shirt. Jack Badarocco was the the founder. He was a great guy and a wonderful instructor.